We can outfit an entire manufacturing location with everything labeled from custom safety signs, OSHA signs, to the machinery and data tags, and even the electrical tags for the facility and its machines. Our decades of experience and our well-oiled production facility assures that you will get the products you need on time and to your exact specifications. Whatever you are manufacturing, we have you covered. Showcasing the most frequently purchased products by leaders in the Manufacturing Industry. We manufacture custom safety, directional, and OSHA signage. OSHA compliant signs are available in a range of custom sizes and substrates. Our custom safety signs can be engraved plastic, vinyl coated aluminum, vinyl coated plastic, and vinyl decals. 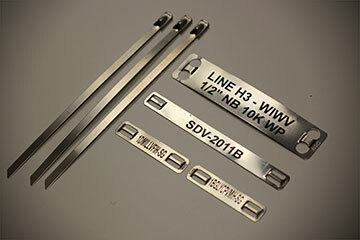 We can provide metal name plates in a variety of substrates including stainless steel, aluminum, zinc, and magnesium. Using these different metals, we can laser etch, rotary engrave, sublimate, acid etch, and screen print, all depending on your durability and cost specifications. Advanced Graphic Engraving provided thousands of instrumentation and wiring tags for a Merck Pharmaceuticals manufacturing facility in North Carolina. Advanced Graphic Engraving produced complex load charts and boom angle indicators used in the manufacturing and repairs of cranes. Here is what our Manufacturing customers have to say about our work. Hello Kelly and Ladies, congratulations on your certification, ordering tags from you is the easiest part of my job, Thanks. Advanced always does an excellent job for me!